K-5 Grades: Yellow blouses or polo shirts and navy blue pants and/or skirts. Footwear: Solid black, brown or blue shoes; students may wear athletic type/gym shoes to class on their designated PE day only. All tops must have short or long sleeves. A solid navy blue sweater or vest may be worn over the shirt. No hoodies are allowed. Permitted bottoms include navy blue slacks or knee-length shorts for boys and navy blue slacks, skirts, jumpers, or knee-length shorts for girls. Jeans and leggings are not allowed. All bottoms must fit properly at the waist and reach at least to the top of the knee. Students who fail to wear the required uniform daily will be provided with a rental uniform. 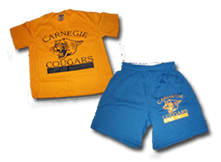 All students are required wear a gym uniform for Gym class. 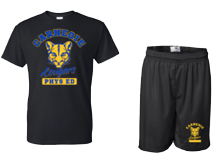 Gym uniforms can be purchased from the main office or via the ePay link on the home page of our website. Not being in uniform on Gym days will have a negative impact on your child’s Gym grade.